Today libraries, schools and community groups all across the country are celebrating El dí­a de los niños/El dí­a de los libros (Children’s Day/Book Day). Commonly known as Dí­a, this national initiative works to emphasize the importance of literacy for all children from all backgrounds. Today children and families in Omaha, Nebraska will receive free bilingual books to take home and will make their own. In Parma Heights, Ohio children will “travel” around the world while listening to stories from a children’s book author. And in Tucson, Arizona a hand puppet show and live music will bring old-world storytelling to audiences at the Pima County Public Library. Check out all the great programs happening through the National Program Registry. Are you celebrating Dí­a this year? Make sure you share your stories and pictures on the Dí­a Facebook page. Or tweet them using the official hashtag (#dia14alsc). And don’t worry if you don’t have anything planned for today! 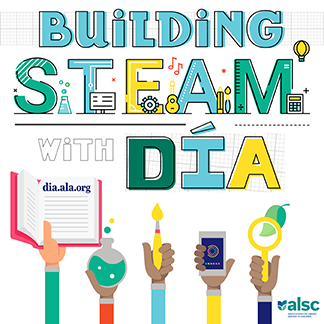 Dí­a can be celebrated throughout the year with the great resources ALSC has to offer including family book club lesson plans, book lists, coloring sheets and more. Download your free resources TODAY and celebrate Diversity In Action all year @ your library!